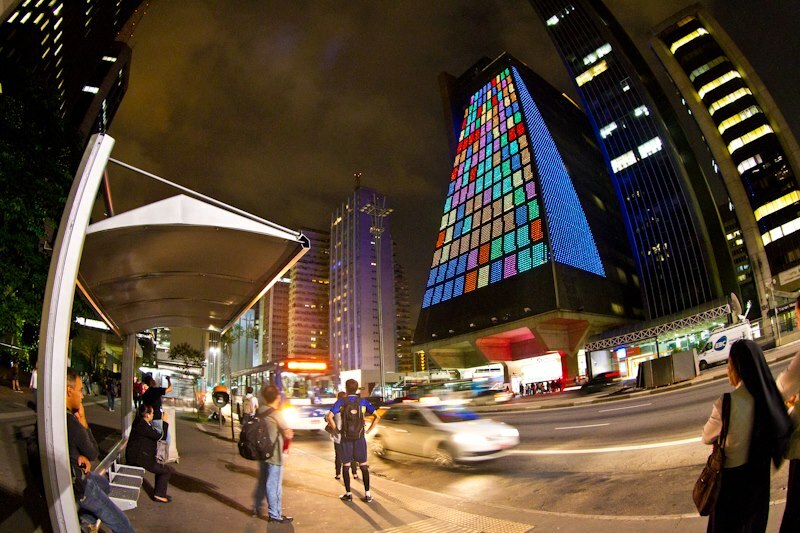 The facade of the SESI-SP digital art gallery was inaugurated in 2012, as a result of a pioneer initiative of Verve Cultural in São Paulo. The “Luís Eulálio de Bueno Vidigal Filho” building, was erected in 1979 at the cultural epicenter of the city. With its particular pyramidal form, the building has been an icon of the urban life in São Paulo, and now plays an important role in the landscape of the city. Recently its facade was turned into the first open air gallery of Latin America. With an electric consumption of 4,5 kVA, the same as a normal residential house, the electronic infrastructure has 26 thousands LED clusters. 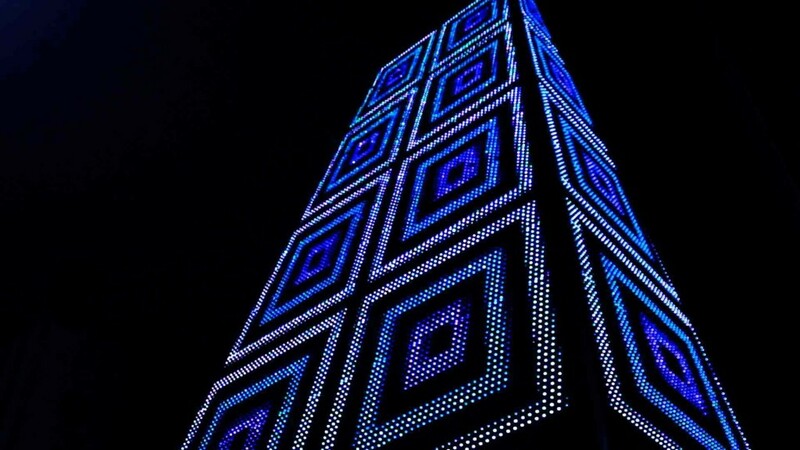 The system allows the display of 4,3 millions of colors. 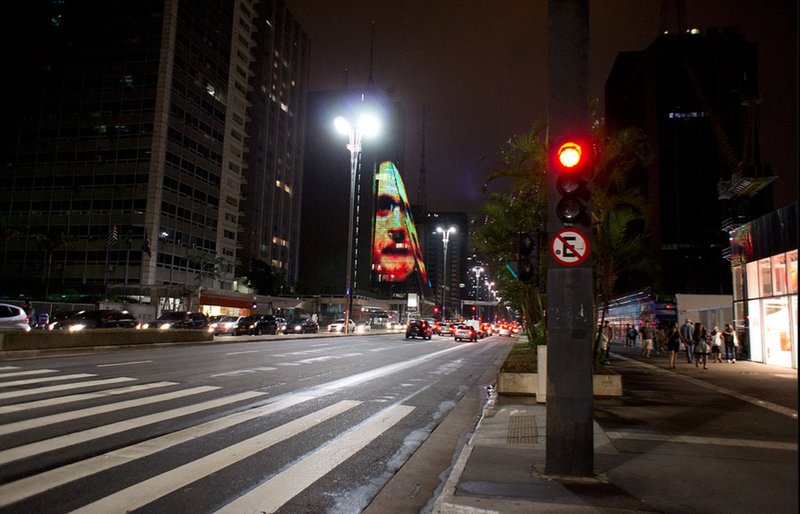 In its opening, with the SP Digital Urban Festival, the platform was mainly used for the display of visual works. The aim was to create a new channel for cultural dissemination as part of the city, promoting the integration of art in urban space through the visualization of magnetic waves, flows of information and the visual expression of São Paulo’s pulse and rhythm. Later some interfaces have been implemented for direct interaction with the public, for example during the Play! exhibition, which was inspired by the universe of video games and highlighted the cultural value of Game Art. The open air gallery concept allows to address issues of interest of the city in an intuitive and participatory manner and raise discussion about the impact that a major metropolis has on the lives of its residents. In 2013, the gallery addressed topics directly related to the citizens of São Paulo: the exhibition VivaCidade translated into digital language a handful of topics, such as the pulse of urban life, natural phenomena like the flow of the seas and the strength of winds, climate change, the search for solutions to maintain the balance between humans and nature, as well as human actions and their role in such a complex and constantly changing ecosystem. Focused on mankind and the consequences of our actions, the exhibition also examined how the locals interact and shape the environment in which they live and what are the challenges to improve their quality of life. 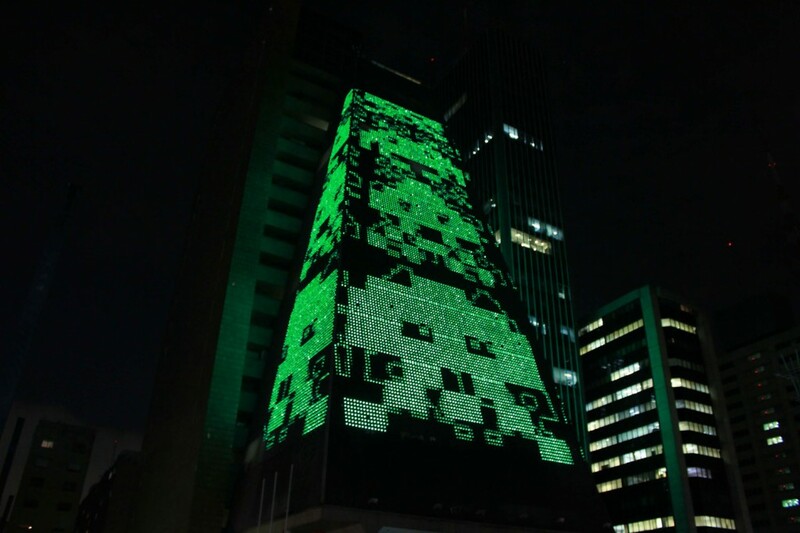 The SESI-SP digital art gallery puts São Paulo on the map of technology and art festivals around the world and at the forefront of cities that integrate culture as part of its urban fabric. The gallery exhibits works of national and international artists created exclusively for the platform. Additionally, it provides opportunity for the creation of partnerships between artists and art collectives from different countries and provides contact and improvement in the use of new tools, applications and games through free workshops and courses.